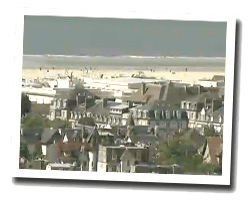 Deauville is one of the most prestigious French seaside resorts, "sister" of its neighbor Trouville located on the other bank of the Touques river. The "Promenade des Planches" is famous worldwide. The American Film Festival offers projections for ten days in september. At the seaside you can find a large sandy beach. 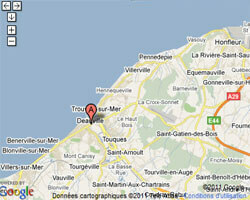 In Deauville enjoy a seaview holiday rental. House 6 rooms 90m2. Close to town centre. 4 Bedroom(s), Final cleaning : included. Studio Apartment 1 room 25m2. balcony. 55 m2 apartment facing the sea in the residence "Villa Gardenia" of Anglo-Norman style. spa, heated indoor pool and sauna in the residence .. Close to beach and shops. Nespresso coffee. Wifi in the lobby. Beds made on arrival. Cleaning included. Price from 890 € to 2130 €. 57 m2 apartment facing the sea in the residence "Villa Gardenia" of Anglo-Norman style. spa, heated indoor pool and sauna in the residence .. Close to beach and shops. Nespresso coffee. Wifi in the lobby. Beds made on arrival. Cleaning included. Price from 970 € to 2380 €. Studio Apartment 28 m2 on the 1st floor in the "Les Flots residence". Balcony with outdoor furniture. Nice view of the sea and the beach. Direct access to the sandy beach. 95 m2 apartment facing the sea in the residence "Villa Gardenia" of Anglo-Norman style. spa, heated indoor pool and sauna in the residence .. Close to beach and shops. Nespresso coffee. Wifi in the lobby. Beds made on arrival. Cleaning included. 3 Bedroom(s), 1 double bed(s). short stays possibility. Final cleaning : included. Price from 1500 € to 3120 €. La Villa Gardénia is an old Norman house, located in the heart of Deauville, This residence faces the sea close to the famous Planches. It offers free access to an indoor pool, steam room and fitness centre. 3 rooms apartment 70m2. Close to town centre. balcony.